Dimensions 1.75 by 11 by 12 in. Comic strip characters; United States; Encyclopedias. Timed perfectly with Marvel's 75th Anniversary, DK's bestselling Marvel Encyclopedia is now fully revised, extended, and updated. Bring the Marvel Universe home with this all-inclusive encyclopedia detailing little-known facts and information about the iconic Marvel characters. This essential tome has been fully updated with 32 additional pages. 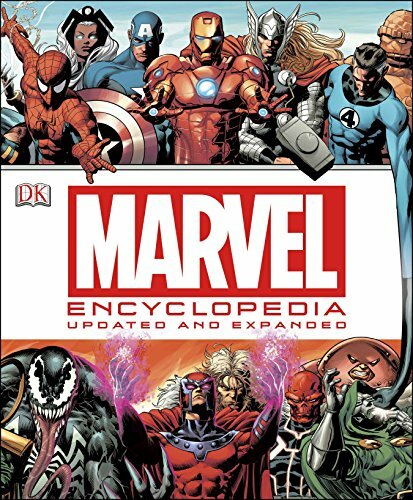 Created in full collaboration with Marvel Comics, the revised pages of Marvel Encyclopedia now feature new entries on the latest characters and teams, updated facts on existing ones including their latest looks and story lines, and expanded entries on major superheroes such as Spider-Man, Thor, and The Avengers. Special double-page features have also been added highlighting recent major crossover events in the Marvel Universe, such as Fear Itself, and the new Marvel Now series. This book wouldn't be complete without the newly commissioned cover art by well-known Marvel artist Mike Deodato Jr..
About: Timed perfectly with Marvel's 75th Anniversary, DK's bestselling Marvel Encyclopedia is now fully revised, extended, and updated.